Kidney and bladder stones do not always give signs when they occur, but if you have one or more of the symptoms, your urinary system may be has a stone. Excessive concentrations of certain substances in urine that cause stone formation, Some substances considered inhibitors are less common in stony patient urine, the influence of some molecules considered as matrices to initiate stone formation, extreme sunlight, dietary changes and urine pH changes with low fluid intake thats are the main determinants. Various types of kidney stones which are related to genetic factors, diet habits, climates, quality of drinking water and lifestyle that are seen in the Table. Table. Classification of Kidney Stones . Knowledge of the type of kidney stone has the great importance both understanding the mechanism of formation and prevention of recurrence, and it also helps in identifying other problems with your health. Treatment methods and diets are different for kidney stones which organic or inorganic composition. Identification of kidney stones, especially with organic-inorganic contamination, is important in terms of responding to treatment procedure to prevent recalcification, therefore, kidney stones are determined by laser material analysis methods (LIBS and Raman spectroscopy) [2, 3, 4]. 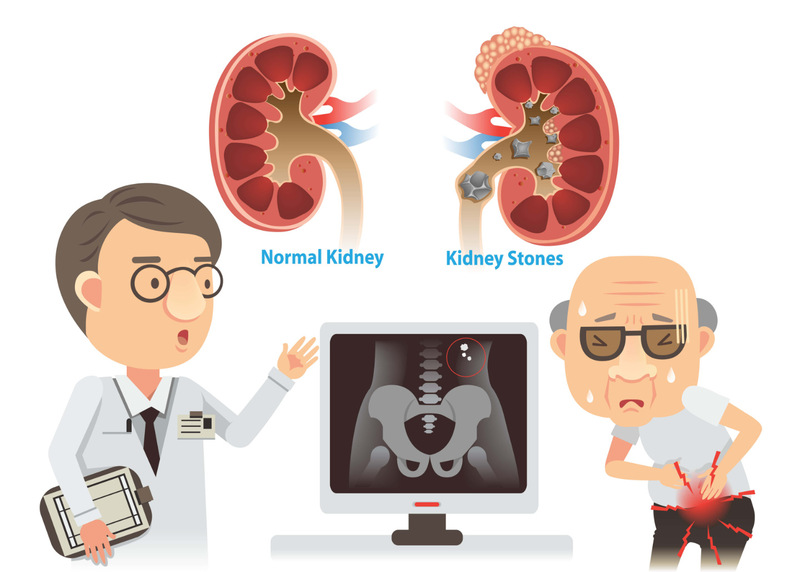 Recent studies show that the percentage of stone recurrence of a patient with a history of stone formation in the kidney is repeated 40-60% within 5 years, the recurrence rate of the patient differs according to the stone type . 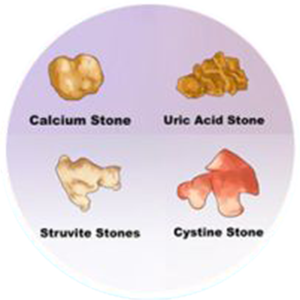 Kidney stones consist of a combination of multiple compounds, determination of the content of uric acid, struvite, cystine and calcium oxalate stones to prevent the recurrence of kidney Stones and drug treatment recommended by urologists and the dietary differences and the knowledge of the stone variety are also important in terms of reducing the risk of stone formation again. It has been reported that some stone species have to be changed eating habits (diet) in order to prevent their recurrence. In our country, IR and XRD methods are used for kidney stone analysis. Laser induced breakdown spectroscopy and Raman spectroscopy are used for analysis of stone type and trace elements of kidney stone. Thus, both the elemental and the molecular structure of the stone are obtained. Moreover, large-sized stone (at least in the size of chickpea) is needed in the other kidney stone analysis methods (XRD and IR). In LIBS and Raman methods, which are analyzed by laser, it is enough to have a millimeter size stone (lentil size). it should be placed in a closed plastic container or a sealed plastic bag. All information (patient, doctor and hospital name and contact information) should be filled on the application form. The result of the analysis will be sent to both the patient and the doctor's email addresses. The approved outcome of the analysis will also be sent to the patient's mailing address. "Simple classification of renal calculi closely related to their micromorphology and etiology", Grases F, Costa-Bauzá A, Ramis M, Montesinos V, Conte A, Clin Chim Acta 322, 29-36, (2012). "Laser-induced Breakdown Spectroscopy Is A Reliable Method For Urinary Stone Analysis", Nazım Mutlu, Seyfettin Çiftçi, Turgay Gülecen, Belgin Genç Öztoprak and Arif Demir, Turkish Journal of Urology, 42(1), 21-26, (2016). 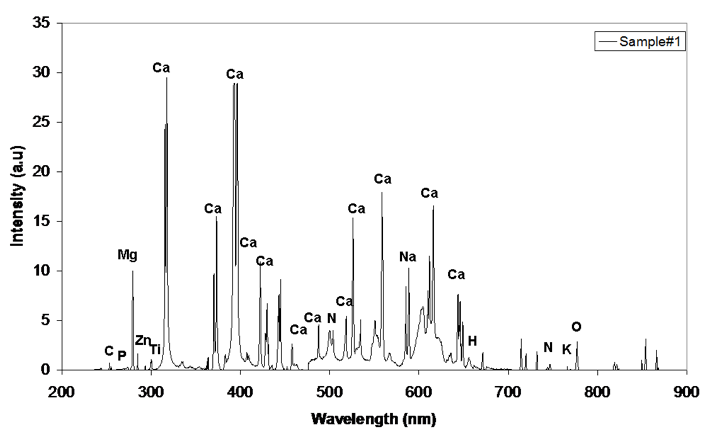 "Analysis and Classification of Heterogeneous Kidney Stones Using Laser-Induced Breakdown Spectroscopy (LIBS)", B. Genc Oztoprak, J. Gonzalez, J. Yoo, T. Gulecan, N. Mutlu, R.E. Russo, O. Gundogdu, A. Demir, Applied Spectroscopy, 66(11), 66(11), 1353-1361, (2012). "Lazer ile Oluşturulan Plazma Spektroskopi Sisteminin Tasarımı, Endüstriyel ve Biyolojik Uygulamaları", Genc Oztoprak B., Doktora Tezi, Kocaeli Üniversitesi Fen Bilimleri Enstitüsü, (2012). "Van Yöresindeki Staghorn Böbrek Taşlarının Biyokimyasal Analiz Sonuçları ve Bakteriyolojik Cesitliliği", Kus A., Van Yüzüncü Yıl Üniversitesi Uzmanlık Tezi, (2008).